I just started watching this anime and I honestly couldn't stop watching. It might be a little weird but I like that it's different than most animes. The characters are very well composed so I strongly recommend starting. If you want to binge watch something, this is definitely something that you can binge watch! I checked out this Anime Dubbed on the Funimation site. It was pretty good. The only downfall I had about the series was Nai. I can't stand his character concept at all. The series also felt a little rushed and the fights weren't all that vibrant to me. Art is absolutely beautiful and is close to the Manga. I suggest checking it out if you like these sorts of Anime. i love this anime so much. i watched it a year ago. and up to this day i still think about it! every time i see AMV's of it i am reminded of how amazing of an anime it is. i would deff re watch it over and over. the story line, characters, and art are so beautiful. Gareki is such a lovable character. I really wish there was a second season. It's so good I just wish it was longer. Definitely one of my all time favorites. The character development is astounding with only one season and I fell in love with all the characters.. nai-kun, gareki-kun, yogi-chan!! Waah they are all so wonderful. Already seen it a few times but I'm such a dork I might just watch it again. So glad it's on crunchy now!! 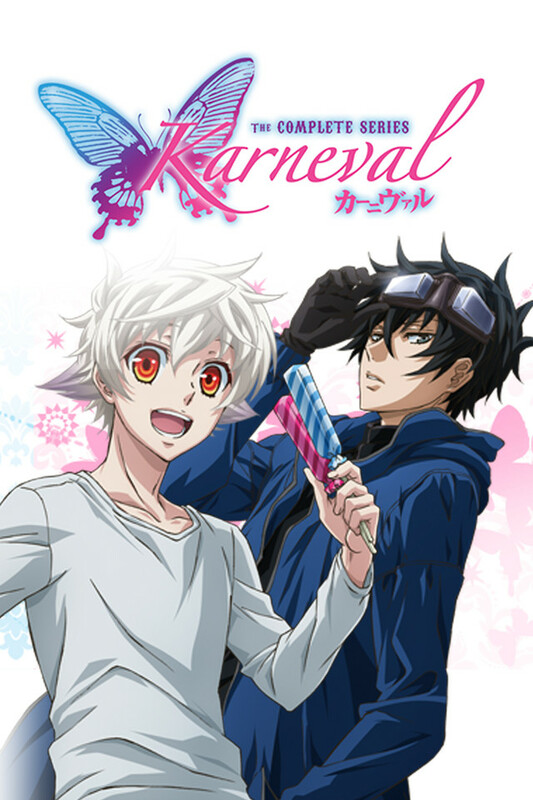 The circus-y aspects of the show really helped Karneval stand out from other fantasy animes. The amnesia trope connected to Nai isn't overplayed, leaving plenty of room for the introduction and development of a handful of really stellar secondary characters. It's unfortunate there aren't more episodes. Thirteen wasn't enough. Personally, I loved this show! While some plot points were confusing at times, I understand that this is derived from a much longer manga series. So what did I love about it? The characters and the aesthetic! Everything (and everyone) was so pretty in this show. And the characters, even the ones who only made brief appearances, were all very vibrant. Overall, I really enjoyed the show and would love to see more seasons. Awesome anime! A little cut off though. This is a great anime to watch! I quickly fell in love with the show and binge watched it in one day! The only thing that upset me was the ending. There was so many different cliffhangers that left me feeling angry when the season ended. I sure wish there was a second season to help tie loose endings. Honestly, I loved this series and finished it in one straight sitting. Every episode had me begging for the next. I don't know why I put off on watching this for such an extended amount of time and I'm sad I didn't get myself watching it sooner. The characters were well developed and the plot was solid. Throughout the course of watching this I laughed a lot, cried, and experienced so many different emotions. I really wish there would be a season two, but I'm glad this series ended on such a good note with the characters.